Our return to the Mediterranean after thirteen years exploring remote areas of the globe has proved to be a magical near homecoming. Firstly, by our gaining a new perspective and appreciation of so many amazing sights and experiences of the trip. Secondly,to be back within easier range of friends and family again. Back in 1976, just two years after launching Mawenzi, our first boat built in the garden, we often found ourselves cruising in company with Chris & Elaine Champ with son Anthony and daughter Nicky. They were also members of Hythe Sailing Club on Southampton Water. Shortly after we were joined by Terry & Margaret Grisely with sons John, Cy & Aran. So began a bond so strong that we referred to ourselves the 'Three Musketeers' and even went off skiing together in the sailing off-season. Two musketeers cruised the Med whilst we took the long way around. 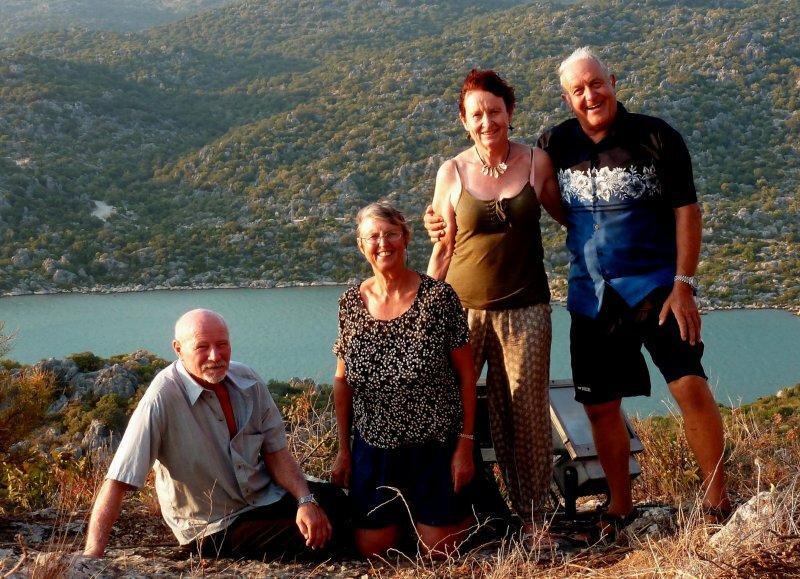 So, in mid April we met-up with Chris & Elaine again in Fethiye for a wonderful week of sustained reunion. 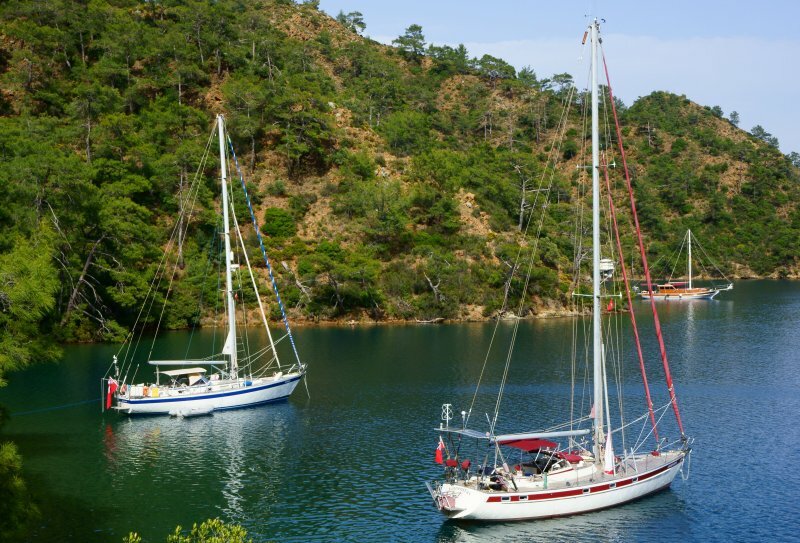 Here we are anchored in company in an idyllic, fiord-like creek in Gocek Bay just west of Fethiye. We kept up our reunions with Ginny throughout the season. 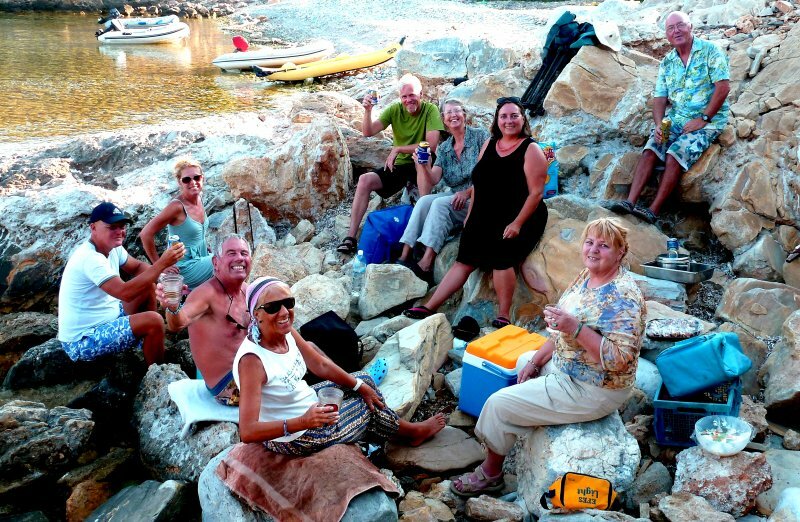 Here we are in our traditional beach BBQ mode with two other crews in a well sheltered bay on the south coast of Agathonisi in Greece. Chris & Elaine are in the front foreground just left of centre. The couple on the RHS are Keith & Carol from Kisten Jayne who we first met in Tahiti in 2002 and have seen regularly ever since. Aside from beaming Di, the others are Per & Ellie, friends of Chris & Elaine along with Per's brother and wife. It was around this time that we became fully aware of the challenges presented by the strong Meltemi winds that blow through the Greek Islands. The fairly constant breeze from the north was much appreciated to keep us cool in what otherwise would have been intolerably hot conditions, however, every ten days or so they would strengthen to 35-40kts when hunkering down in a well sheltered bay with good holding for the anchor was the only solution. Even more exciting for us was the welcoming of our first grandchildren aboard in Marmaris late in May. 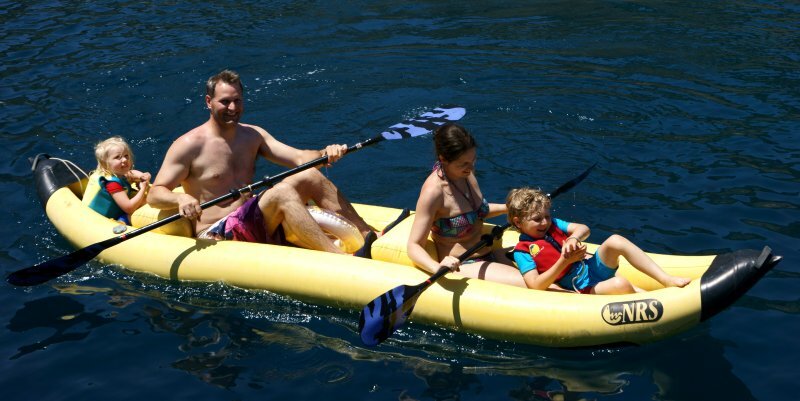 Younger son, Paul, wife Emma with Alex (5) and Chloe (3) settled-in swiftly so we could set sail immediately, heading east along the coast toward Fethiye. First stop was Ekinsic at the head of a bay close to the shallow entrance to the Dalyan river with the nearby ruins of ancient city of Kaunos and the town of Dalyan with numerous natural mud springs. 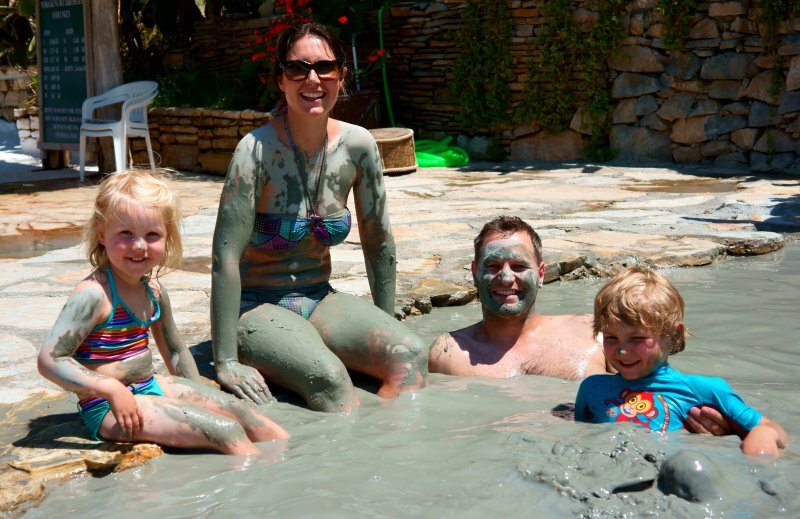 Given the difficulty one normally has getting children to avoid dirt and mud, we found it equally difficult to get them to enjoy it. We all had a fabulous couple of weeks of warm, dry weather in which we explored the islands and creeks of Gocek bay, even dressing Amoenitas overall with signal flags to celebrate the Queen's Jubilee weekend. 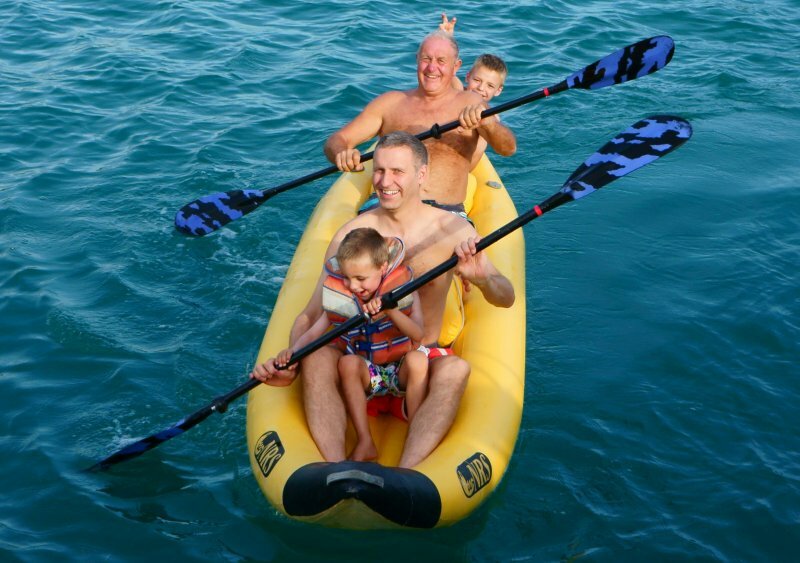 An inevitable favourite was our inflatable 2+2 canoe, christened Yellow Peril by cruising friends in the South Pacific. We'd acquired it to do serious underwater marine exploration amongst the reefs where outboard motors fear to go but it rapidly adapted to a new career as a children's runabout. Another great occasion was the visit of our New Zealand relatives Pete and Margs with whom we had spent a lot of time on their dairy and goat farms in the Waikato. Pete had taken a shine to sailing and been with us on a couple of trips between NZ and Fiji. They are also keen Trampers, as hiking is referred to down-under, we all having done the Milford Track together. So, inevitably, we stepped ashore in boots in a number of remote bays to explore the rough Turkish terrain of sharp rocks and even sharper spiky vegetation. Finally, older son Bruce with Tracey and sons Sean (8) and Ryan (5) came out for the autumn half-term in late October when the weather was still dry and the days warm and sunny. This time we were in our winter base at Finike so took them off to explore the lovely sheltered area of Kekova Sound. This is only 2-3hrs sailing away with masses of antiquity to explore from many secluded anchorages. 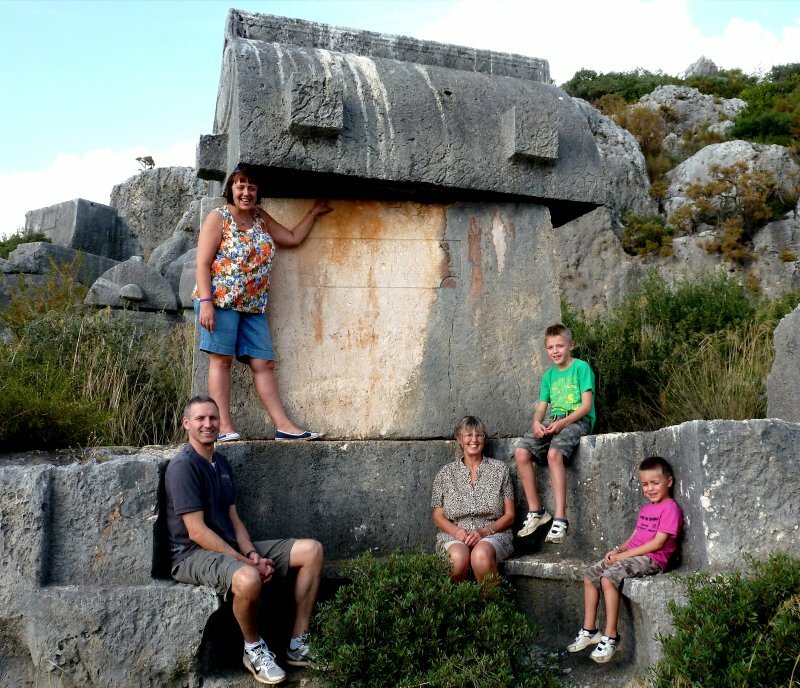 Here's the clan at the site of a number of sarcophagi close to the shore at Ucgiz a small town on a very sheltered inner bay. This particular one which probably dates from the Lycian period around 1,000 years ago, uniquely had seating incorporated. The six large lugs were used to transport and install the tomb lid. The spline along the top was reputed to represent the keel of a boat, almost all of these were aligned in an east/west direction. All also had either displaced lids or access holes cut into them, courtesy of tomb robbers. All this area was the scene of wars and marauding pirates for many centuries. Word of Yellow Peril had spread from Alex & Chloe so it became a near daily event to splash around in it and being so stable, there was no hesitation in letting anyone take it off on their own. So ends our brief description of the family visits that we had so much looked forward to and which had been a major driver in our decision to return from distant waters. Now we can share with you some of our experiences from voyaging along the south and west coasts of Turkey and around twelve of the Greek Aegean Islands, as well as a trip we made to Cappadocia in the Turkish interior..
We must start by apologising, as there are rather a lot of pictures and many feature ancient rocks and ruins which are around those parts in great profusion. We took great pleasure in educating ourselves in the Classical history that we had either never received or forgotten from the long-off school days. The tour follows a westward progression from Finike, our Turkish base, to Samos the most northerly Greek island we visited. Just a 45min Dolmus (bus) ride west of Finike is the coastal town of Demre with two significant ancient sites. Just on the outskirts is the cathedral where Saint Nicholas, of Father Christmas fame was bishop, dying there in 350AD. It is a major site of pilgrimage for followers of the Coptic Orthodox Faith, being a particular favourite of Russian tourists. Apparently, his link with chimneys was said to be the result of his taking gold coins to a poor family with several daughters. The door was locked so he made the delivery down the chimney. 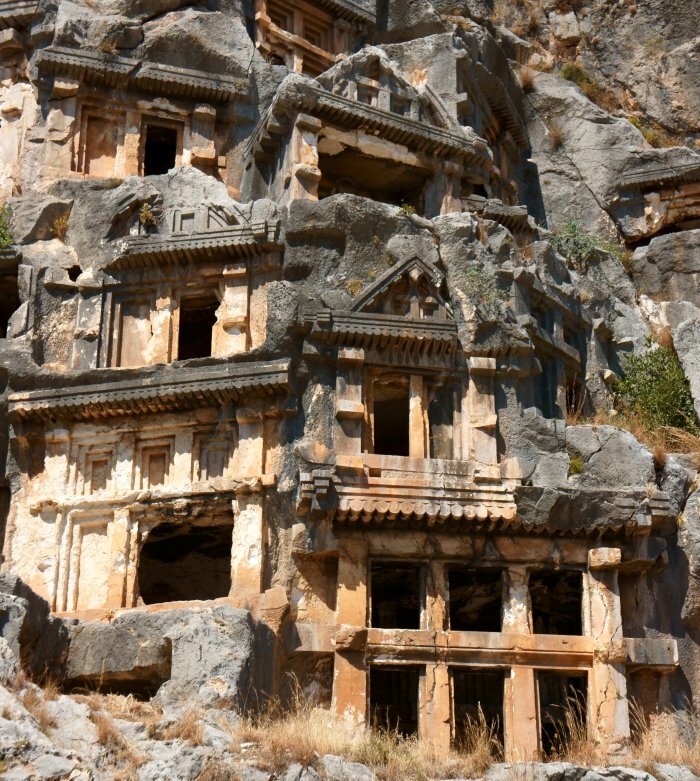 Around 6Km out of town is the outstanding site of ancient Myra, famed for the splendid Lycian tombs carved into a cliff face. Again, every one has had an forced entry cut into it. There is also a magnificent large amphitheatre just beside the tombs. Little else remains and ubiquitous poly-tunnel based agricultural structures encroach right up to the site boundary. 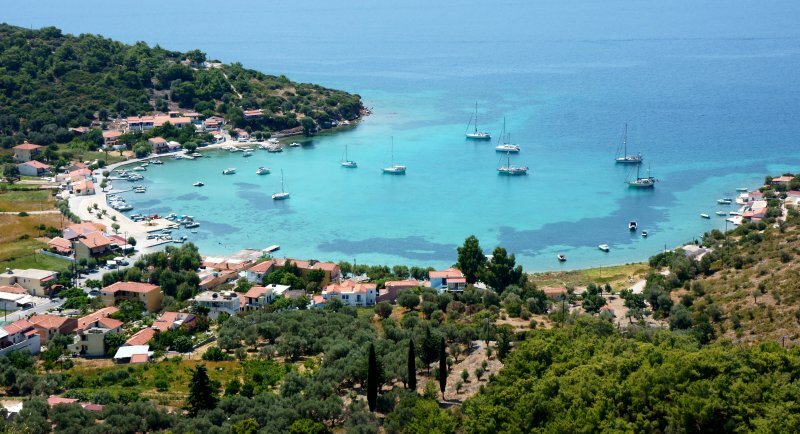 Around 15nm west of Finike is an area protected by an offshore island called Kekova, the roads within harbour a mass of small islands and sheltered anchorages. 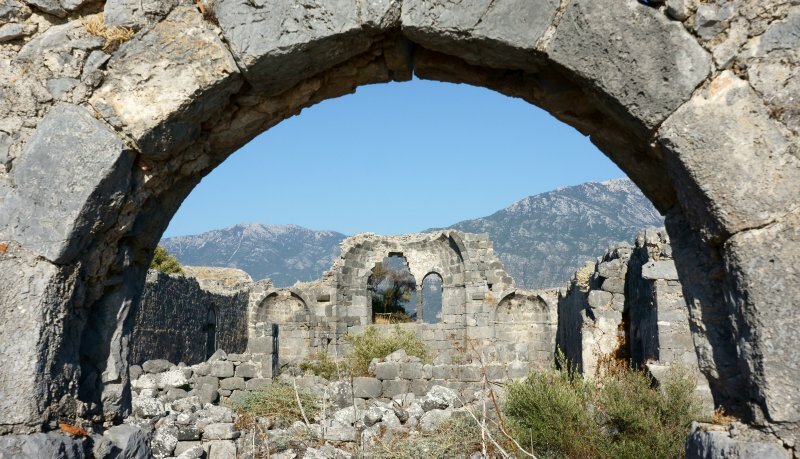 Whilst in Gokkaya, a long bay with temple ruins at its head, we located the 730Km long coastal trail known as the Lycian Way which almost links the major city of Antalya in the east with the town of Fethiye in Gocek Bay to the west. Whilst walking these trails we stumbled across a further marked track that led to the remote ruins of the ancient city of Istlada which was probably destroyed by an earthquake in 2BC. 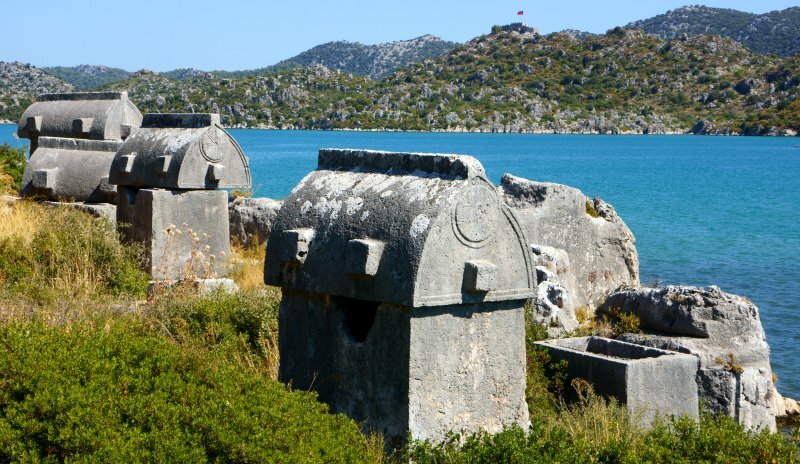 It is a remarkable example of the remains of a community which over around 2,000yrs spanned the Lycian, Hellenic and Roman periods. The quality of the stonework, often with huge perfectly cut slabs was impressive. Most of the city was built on a steep south facing hillside with ancient fields below. 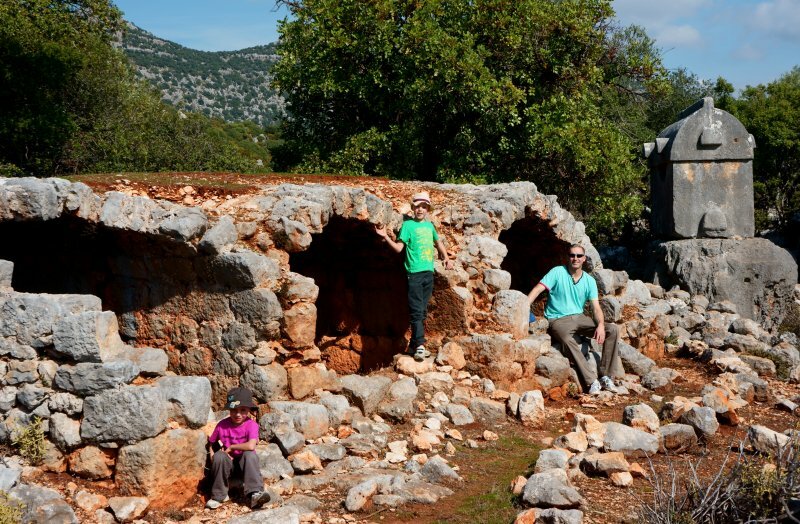 Here Bruce and the boys are exploring the area at the top of the settlement with well preserved arched rooms and a pretty intact sarcophagus. This is such a remote and difficult place to find, there must be precious few people who discover it. Also within the roads is the small town of Kalekoy, nestling on a steep hillside below an ancient castle. There are no roads or connections out other than by sea to the town of Ucagiz in a further sheltered bay behind. The harbour illustrates the geological sinking of the area with half submerged tombs and stone docks around 1.5m below the current surface of the sea. Just around the corner in Ucagiz there is a most impressive array of tens of sarcophagi in a beautiful setting just beside the sea with the fort at Kalekoy in the background. As is usual, the lids have been displaced or burial chambers broken-into by tomb robbers. Note again the uniform east/west alignment of the boat keel lids with six lifting big lifting lugs for transportation. This is becoming a tale of ancient rocks, ruins and structures because they are so prolific and usually of significant interest. Even small offshore islets are not immune. This one only around 300m long was covered in ruins. Hidden atop this small islet were the ruins of this huge temple which suggests the site must have been home to a religious community. This was borne out by the large number of big cisterns used to collect the water falling onto the roofs of buildings. Behind, across around 2nm of water rise the dauntingly impenetrable range of coastal mountains that border most of the coast in this area. On our way along the Turkish coast we called in at the small resort town of Kalkan where we anchored stern-to to the outer side of the harbour mole, as inside it was pretty full. There we experienced for the first time the not uncommon experience of diving off the boat into water which had a very cool upper layer of fresh water from the mountains which welled up from undersea springs. Quite a rude awakening if you aren't prepared and expect the usual ogin at around 28°C. Whilst there we discovered we could take coach trips to many of the local inland attractions of the area, so took off to cram in as much as we could take. 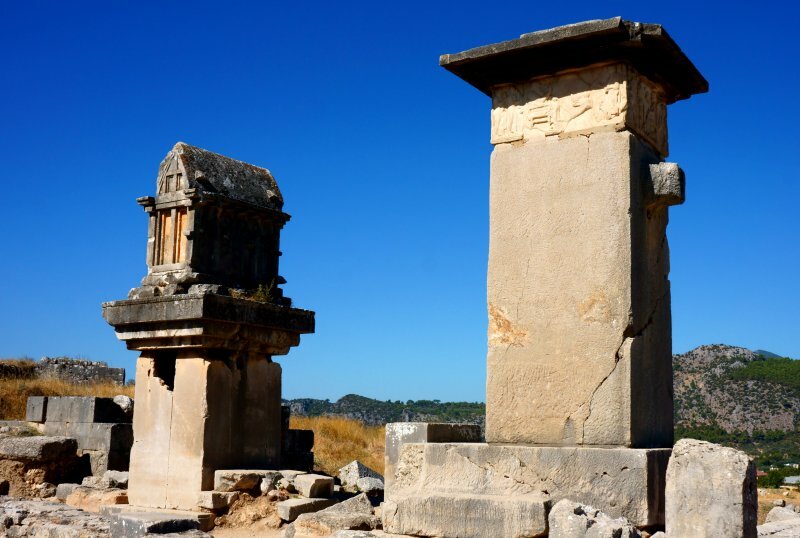 The first stop was the ancient site of Xanthos with a huge amphitheater, fascinating pillars with multi faceted inscriptions in several ancient languages and these two differing examples of elevated tombs. 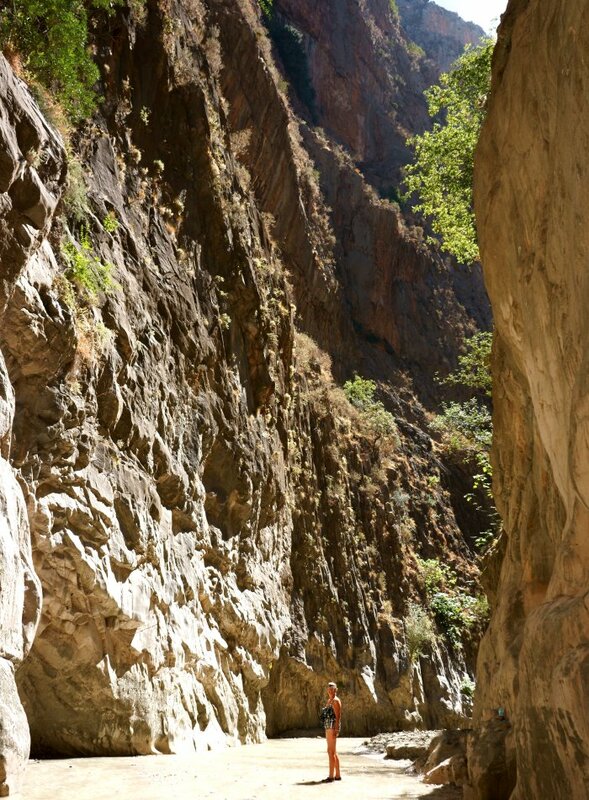 Next stop was the Saklilent Gorge, impressive and extensive. Looking at Di there, high and dry, standing alone in a swimming costume gives a totally wrong impression of the place. Firstly, it was inundated with hundreds of visitors but secondly at its mouth was a roaring torrent of water entering from the side. Negotiating this waist deep torrent over a rocky river bed significantly depleted the number of visitors penetrating to the inner gorge to just the intrepid few. At the mouth of Gocek Bay we anchored in a remote sheltered hole with a path to a further set of ruins at Lydae, a small, unimportant settlement in the hills. The buildings were in a poor state but there were two perfectly preserved cisterns. These come in numerous forms and in such an arid climate were key to the survival of settled communities. 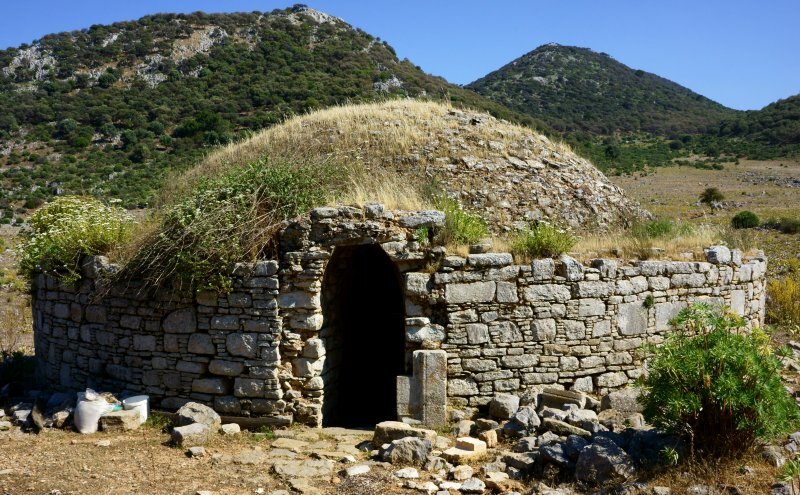 These traditional dome structures housed circular storage tanks which went down to around 5m under ground level. The well formed stone walls were lined with a smooth, white cement formulated especially to have low water penetration. They were filled in the wet season, beginning in November from pipes to streams or from run-off from the roofs of buildings. This one was still half full and was providing irrigation for the vegetable plot of a nearby farm via a plastic pipe around 500m long using the siphoning from a 50m of so height differential. Marmaris, within its large sheltered bay was the point at which we had entered Turkey and in the picture below of the old town castle and almost deserted waterfront looks an idyllic place. This early season vision is less than representative, as from May onwards the place heaves with the lowest common denominator of northern European tourists. The crowds, noise and hassle ashore made for fleeting visits only, as we traversed back and forth on various local trips. In complete contrast, just 30nm to the west was Serce, a perfect haven of peace where we first set out to climb through native bush to access the hillsides beside our anchorages (Amoenitas is the LH boat). This can be a challenging operation as the terrain is extremely rough with sharp rocks and even sharper spines on the vegetation. The only tracks are the tenuous ones left by goats which meander in almost every direction, so progress is made in a series of approximations towards where you would like to go and retracing your steps is virtually impossible. 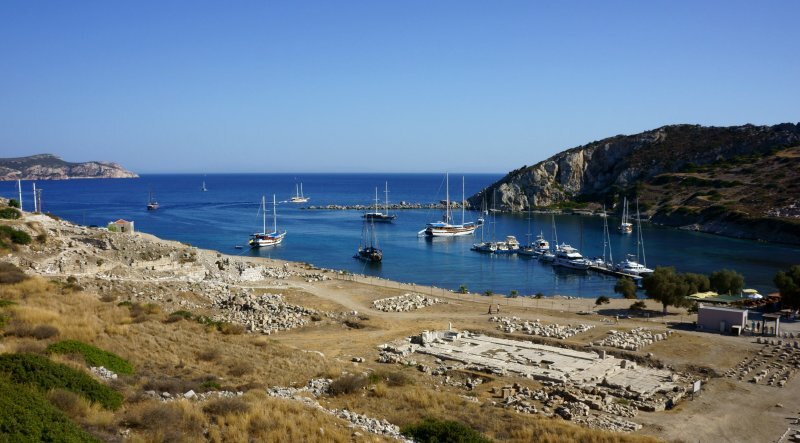 Just a few miles further westward from Serce, where the coast turns northward towards the Bosphorous and Crimea, are convenient twin anchorages at the site of ancient Knidos. This was a large community of over 15,000 souls, an estimate usually based on the seating capacity of the amphitheatre whose major role was normally as a community meeting place rather than for entertainment. There are few standing remains close to shore but on the hillside above were a mass of buildings in the process of excavation. It is often the case that only 15 to 25% of sites are exposed, leaving the huge remaining task to future generations. The imposing Temple of Apollo below was the second largest in the ancient Grecio Roman empire. Paradoxically it is sited within a huge sprawl of indifferent housing at Didim, a suburb of Altinkum, one of those modern depressing, over commercialised beach resorts where the incessant noise of jet skis only gives way to overpowering disco music. This persists until around 4am and is followed by the noise of police sirens mopping up drunken stragglers. Sadly, there are too many of these resorts in Turkey and even more depressing, Brits often appear to be their primary customers. 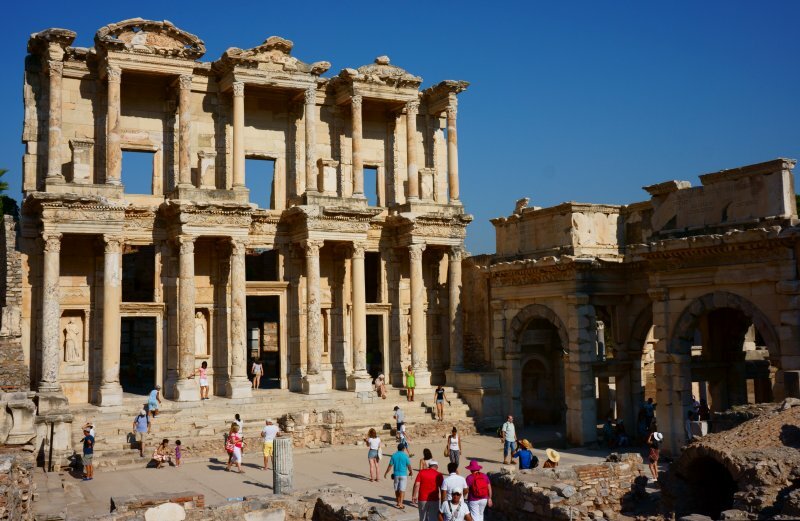 Whilst Didim is a less visited ancient site, Ephesus below is probably the most famous in Turkey. 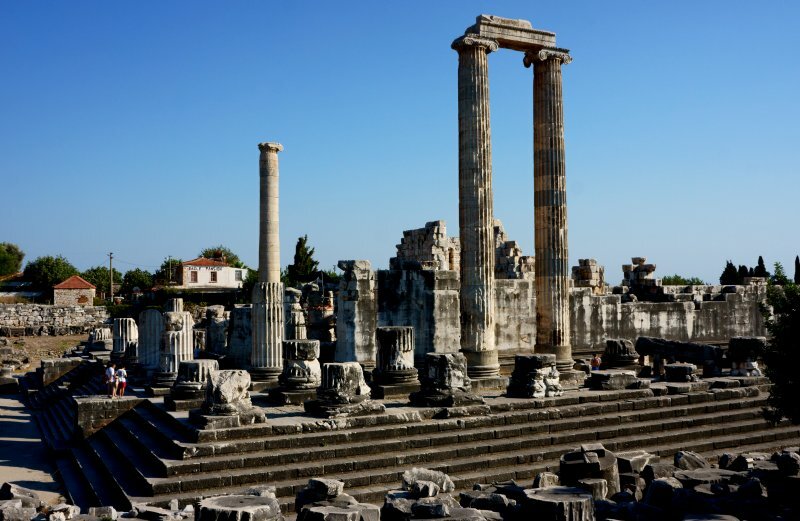 The whole economy of the region and particularly the nearby port city of Kusadasi is dedicated to tours of the extensive but again only partially exposed ruins. There appear to be at least 3,000 visitors wandering around at any time, starting at 9am. Many visitors come to the port in huge cruise boats with four crammed into the small dock whilst we were there. 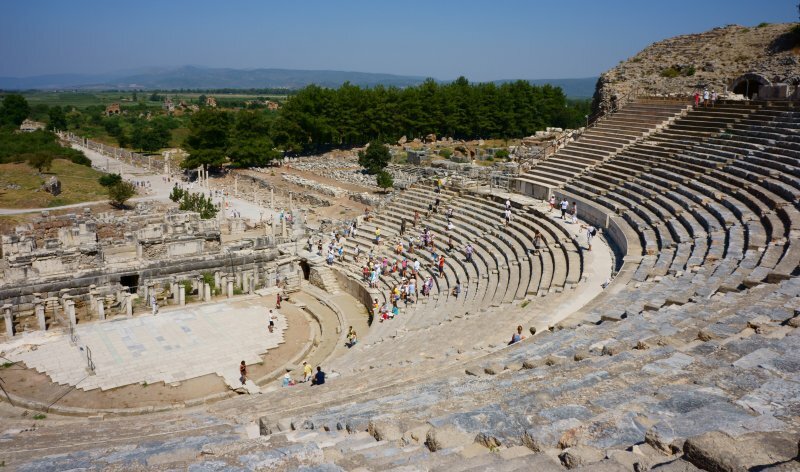 We have mentioned amphitheatres a number of times as most large Grecio/Roman cities come equipped with at least one. However, the first and only one we will show is the extensive one at Ephesus, a splendid, well preserved example. 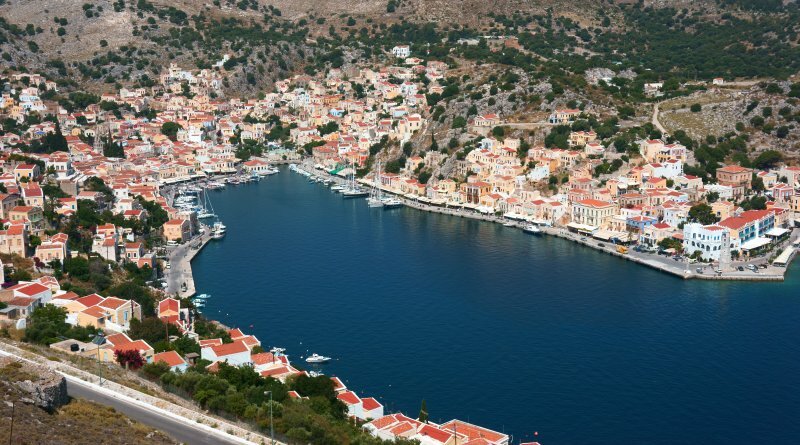 We entered Greece at the tiny island of Symi, just off the SW corner of Turkey. The harbour there was a good introduction to a new country with its crowded mass of coloured houses looking architecturally distinct from those we had been used to 5nm across the water. Also different was the complex check-in procedure at a number of dispersed offices with lots of staff who appeared to have very little to occupy them. We spent many hours exploring the hillsides covered in small houses, mainly derelict, linked by a labyrinth of small passages. From Symi it was a day sail up to Kos, one of the larger Aegean islands where we anchored under the walls of a large Crusader fort, very close to the heart of the main town. 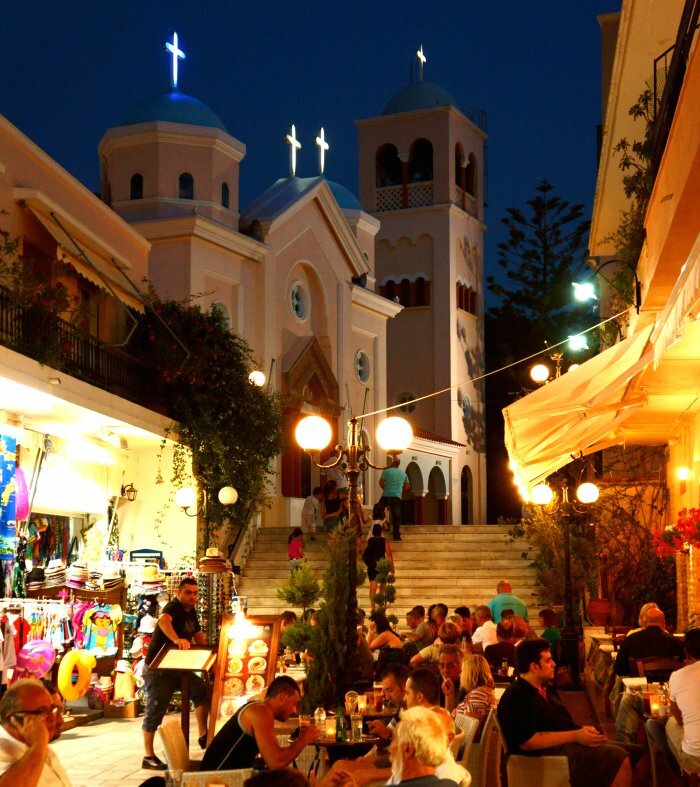 Again we were in a tourist haven, so joined in with the crowd visiting the sites and chilling out in tavernas. In that balmy climate the visitor scene is full-on from ten in the morning until the early hours of the following day as in the street scene below. Kos was large enough to warrant hiring transport to explore the mountain villages and bays at the far west of the island. 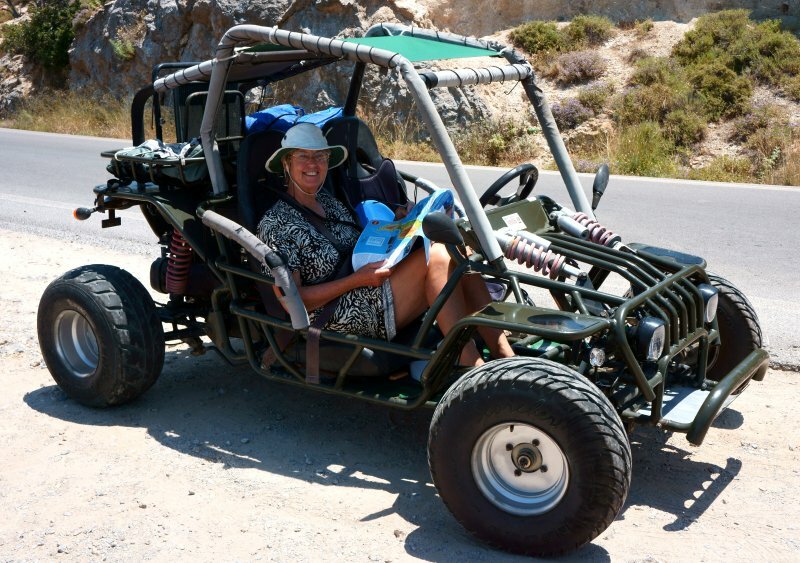 What better than a fun buggy like this with natural air conditioning. Pity it didn't have a handbrake or reverse gear that worked as well. We survived the day carrying a stone to shove under a wheel but manoeuvreing to turn the thing around was often challenging. Of course the guy who rented it to us was totally unconcerned when we returned it and its probably in the same state today. Yet a further example of the way Greece works, or doesn't. 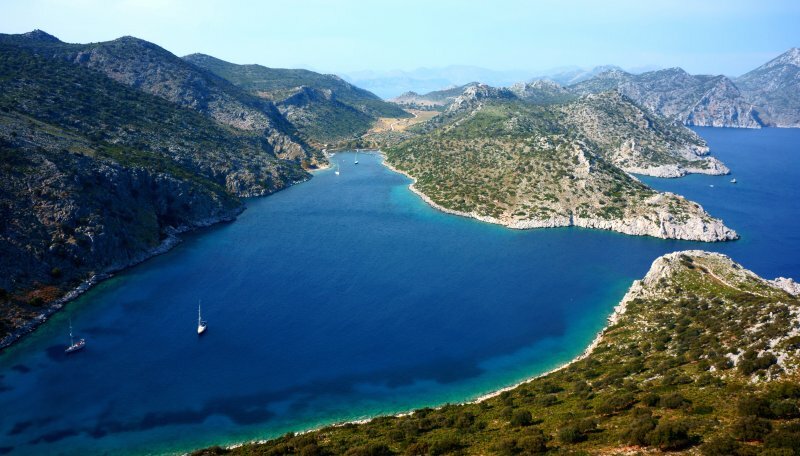 Pretty soon we realised the islands of Greece differed from the Turkish mainland in that they were without exception very arid with more exposed rock and less vegetation. Fortunately, most are quite high with deeply indented creeks offering good shelter from the strong Meltemi blows which appeared every 6-8 days or so. The tiny harbour at Vathi on Kalimnos below was not untypical in that we entered down a narrow channel around 50m wide and 800m long with 300m sheer cliffs on either side. The town was isolated but had a number of good tavernas and lots of good walks onto the hillsides. 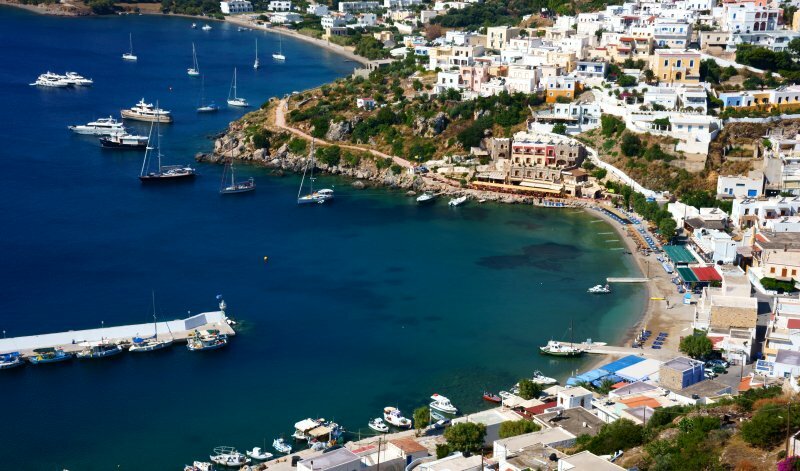 For sheer charm, the little port of Pantelli on Leros took a lot of beating. It is surrounded by a town climbing the steep hillsides enveloping it with traditional windmills on the highest ridge and a huge ancient castle at its northern end. Again Leros was large enough to warrant further exploration by road so we hired a quad bike for a bit more excitement. Beside the castle at the far end of the hill beside the town of Panteli was a traditional church with a stupendous view out over the bay to the north. In the yard is a well preserved bomb casing of second world war vintage. The island was the focus of a major German airborne attack to build a fortified base against the advancing Allied armies in the dying days of the 2nd world war. We tended to favour small sheltered bays on the south of islands, rather than the port towns usually found on the east or west coasts. South facing ports would not be good news in winter storms, the strongest of which usually tend to start blowing from the SW and clocking round to the SE. Here on Fournoi below, the walk to the main town from our secluded anchorage took nearly two hours and traversed some steep slopes but the views were more than adequate compensation. 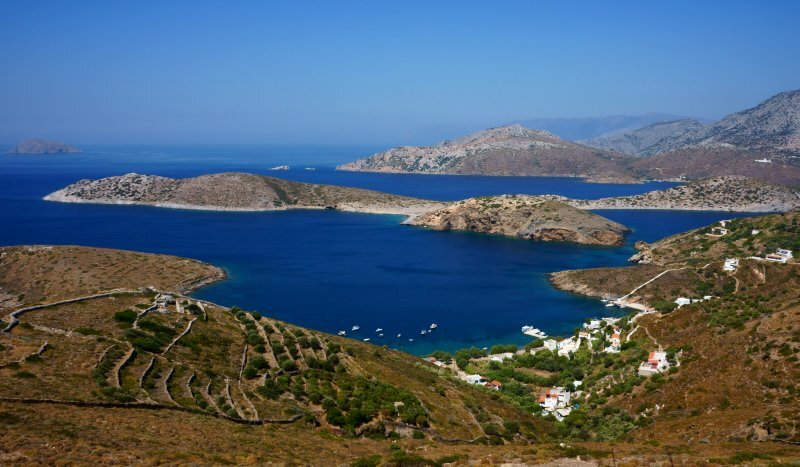 The island of Samos tucked close under the Turkish coast was to be our last island in Greece. We were there in company with Chris & Elaine on Ginny, our old sailing friends from way back plus Keith & Carol on Kirsten Jayne who we had met up with in Tahiti many years ago. Chris & Elaine's son Anthony with wife Kirsty and three sprogs were about to join them, so not having seen them since we set off on our odyssey, we hung around for their arrival before heading back to Turkey. 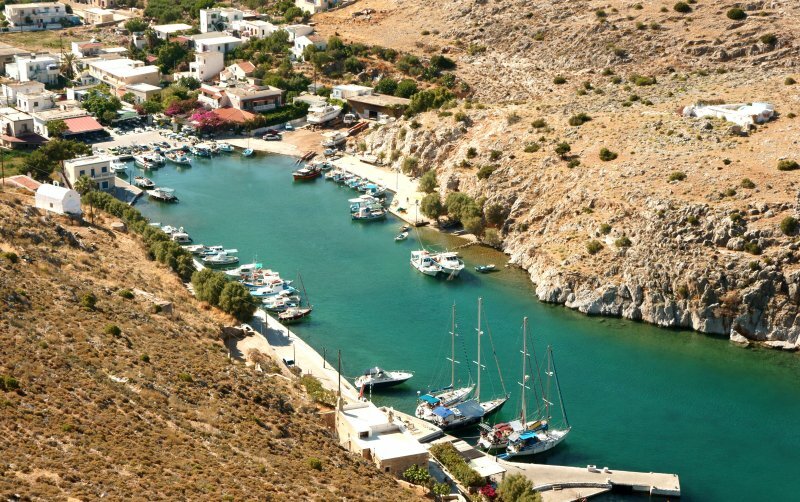 Here Amoenitas is anchored in the outer port of Pythagorion, guess which mathematical guru hailed from this port? 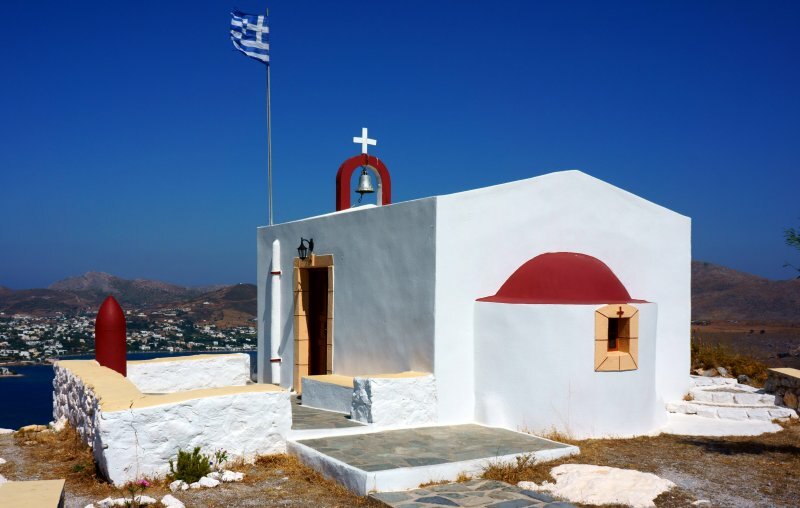 Around an hour's walk out of Pythagorion, much of it steeply uphill, is the charming Panagia Spiliani Monastery with its extensive views out over the bay and deep caves with chapels and religious works of art. Close by is a wonder of early civil engineering, the Eupalinian aqueduct, a tunnel cut through 1036m of hillside to carry water from a spring to the town. The tyrant Polycratesre had the tunnel dug in the sixth century BC when it operated for over a thousand years before its rediscovery in 1883. 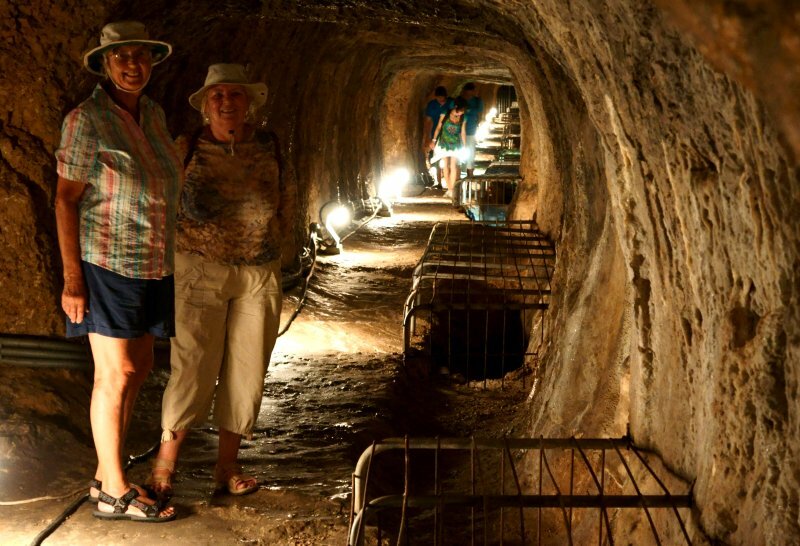 Di and Carol from Kirsten Jayne are seen here in the substantial inspection tunnel, the water had flowed in a further channel below that could be accessed through the holes beneath the metal grills. 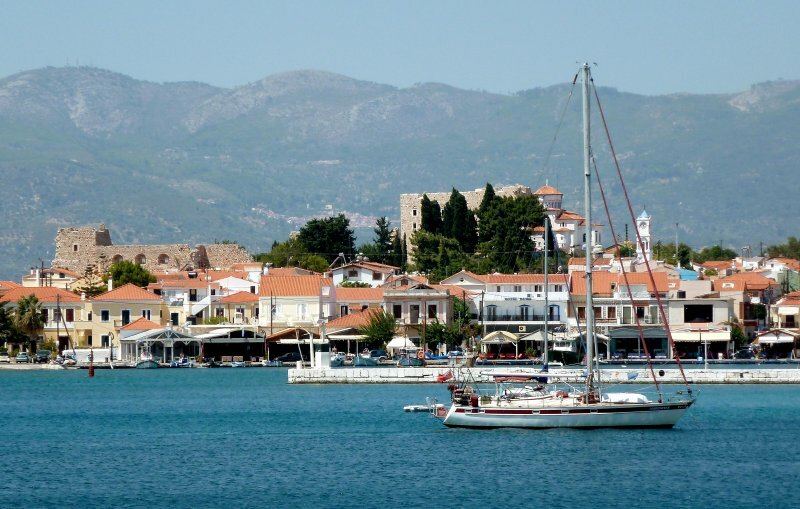 Just 10nm along the coast, at the closest point between Greece and Turkey where the Samos Channel is barely 1nm wide is a charming anchorage in the quiet town of Posidonion. There are a couple of tavernas but more important was the access to a number of trails out onto the hills. Steep walking but with magnificent views to seaward plus a bonus of fresh, ripe, sticky figs from numerous wild trees by the pathways. 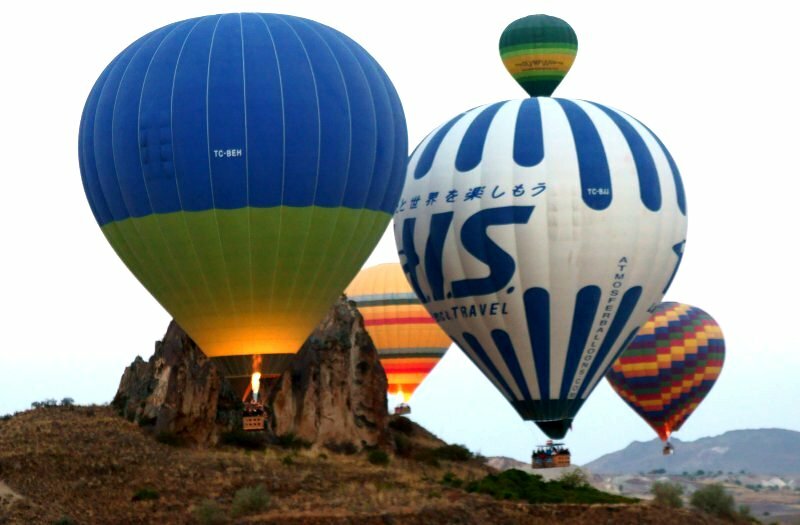 In October, after we had hosted our Kiwi relatives in Finike, we decided to head off for some inland touring of Cappadocia, a region renowned for its amazing natural rock formations, it is a world heritage centre and one of Turkey's top tourist attractions. Old sailing friend Margaret heard of our plans and decided to join us, so we met up in Antalya for the overnight, 9hr coach trip. Yes, Turkey is a big country. The sight that greeted us next day was almost magical. We had been expecting the weird formations, known locally as fairy castles but were not prepared for the number and extent of these structures. 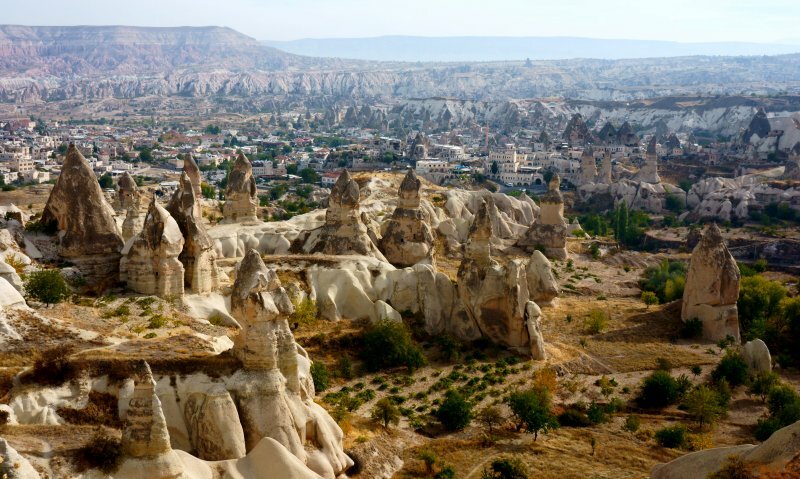 In the centre of the picture below is the town of Goreme where we based ourselves in a hotel carved into a cliff face, bedroom, bathroom and all. Our intention was to hike around the region, covering as many of the well posted trail routes as possible. 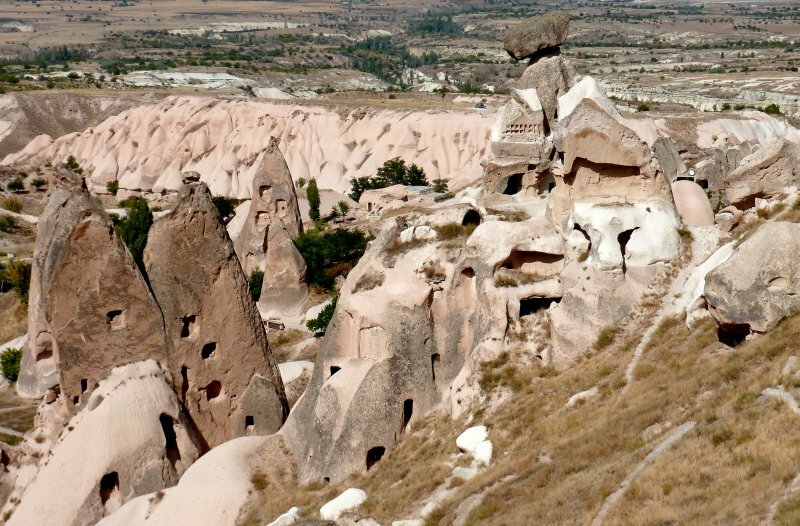 Below are early, somewhat crude dwellings cut into formations of rock around the base of Uchisar, a high fortress town commanding outstanding, almost airborne views across tens of kilometres. A construction team excavating the soft rock could produce one room a day, originally using only basic tools of animal bones and antlers. 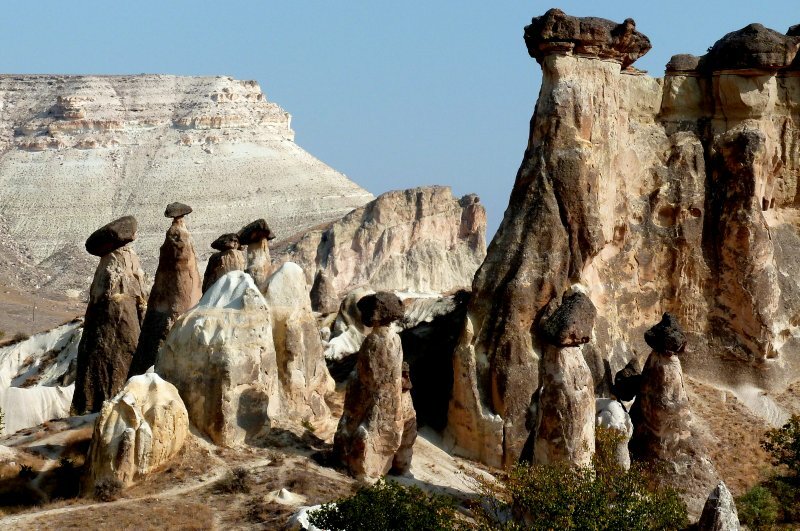 The formations below just outside the town of Cavusin are so distinctive that it is seems impossible they were formed by a natural process. However, inspection of the hillsides beyond give a clue to the way the layered cliffs eroded leaving a capping of harder rock atop a narrow pillar. Some examples were quite bizarre, the ones below having earned their location the name Love Valley. Walking the deep depressions carved out by ancient rivers yielded an unending series of revelations of deep gulleys, natural bridges and high cliffs, almost all having provided dwellings at some stage. 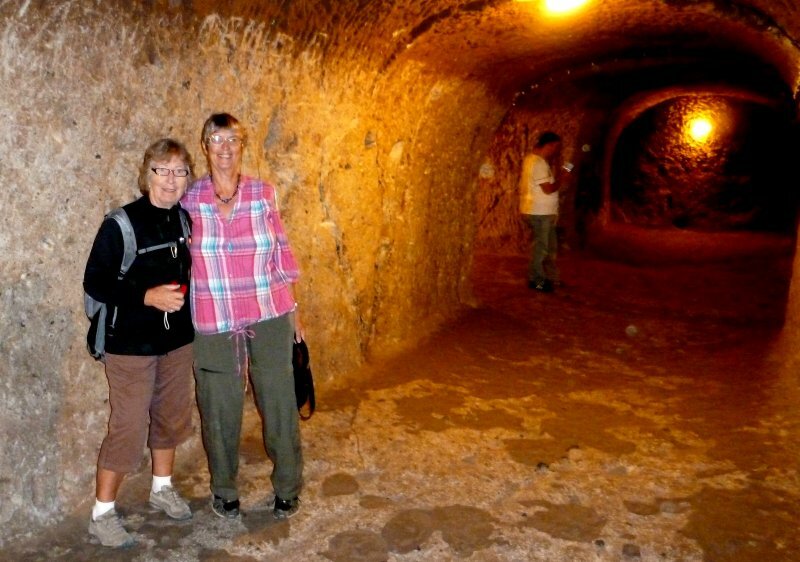 Below, Di and Margaret are deep below ground within an underground city at Derinkuyu. This was the biggest of around 47 in the region that could house and protect up to 15,000 people each for up to a year. They provided refuse in the times of invasion from Persia and pirates over many centuries. This one has five layers, interconnected by a labyrinth of tunnels and stairs with ventilation shafts to the surface and even bowers for animals, usually kept close to the entrance at the highest level. Dave got to go on one of the famed balloon trips, surprisingly neither of the girls seemed to want to take the risk. Little did they realise what mass tourist events these were. As you see here, the traffic was pretty heavy, Dave having counted just over 100 balloons around in the sky that morning. Winds are a problem so we started before dawn at around 05.30 and were back again just 3hrs later. Naturally it was a unique experience gliding silently above such scenery, the only disappointment being that the light was so poor almost to the point of landing that conditions for photography were less than ideal. Better this though, than landing much later in a breeze and being dragged over the countryside in a basket by a oversized bag of hot air. Marina life is not without its diversions. 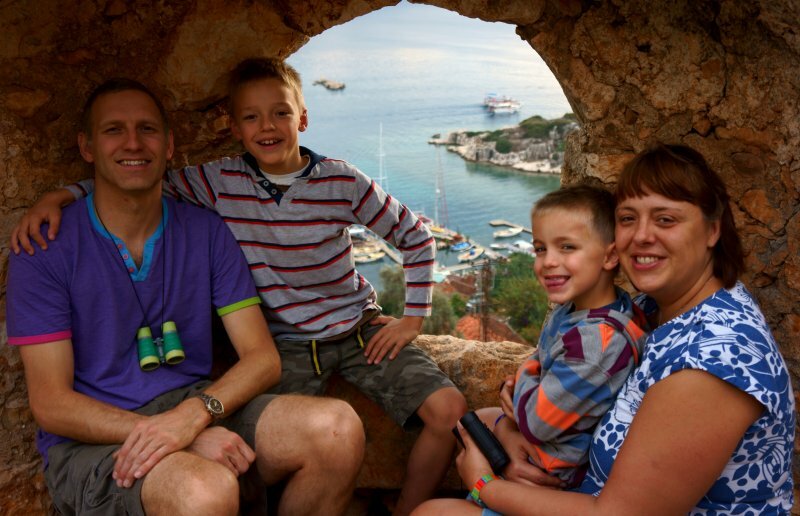 Every couple of weeks a group of us pile into a bus for the 2hr trip to the nearby metropolis of Antalya. After a bash in the big stores we have dinner and repair to the concert hall. 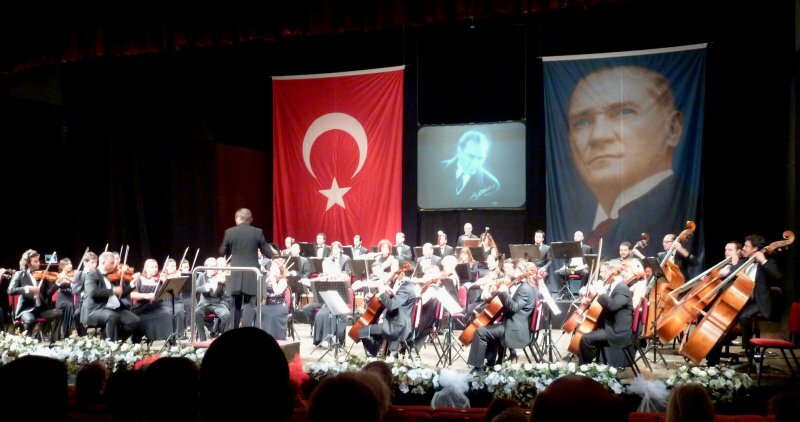 Mid-November was memorable for a concert dedicated to the death in 1938 of the nation's founding father, Kamal Attaturk. It was also the best performance of Beethoven's seventh we can ever remember. The Turks are a proud nation and especially dedicated to Attaturk who almost single-handedly set up the newly freed country as a thriving, secular democracy. We have really enjoyed our first season of Mediterranean cruising. That, coupled with the further un-inspiring 2012 summer in the UK has brought us to delaying any thoughts of selling Amoenitas, swallowing the anchor and returning to the rustic pleasures of the New Forest. Probably a good thing as the second hand boat market appears pretty dead. So, its back to the old plan, not to have a plan. We are within a couple of months sailing from Home Waters here so will continue to take each year as it comes.